Several years ago, a group of ladies at my church put together a recipe book of just salads. It's maybe 12 pages long and just stapled together paper, but I LOVE it! It's my go-to recipe book when I need a good salad/side dish. 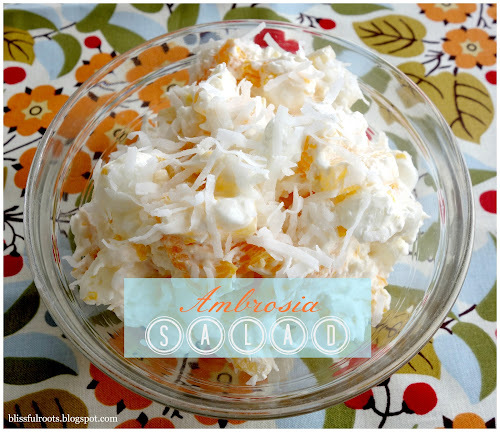 Have you ever heard of ambrosia salad? You probably have eaten it even if you don't recognize the name. 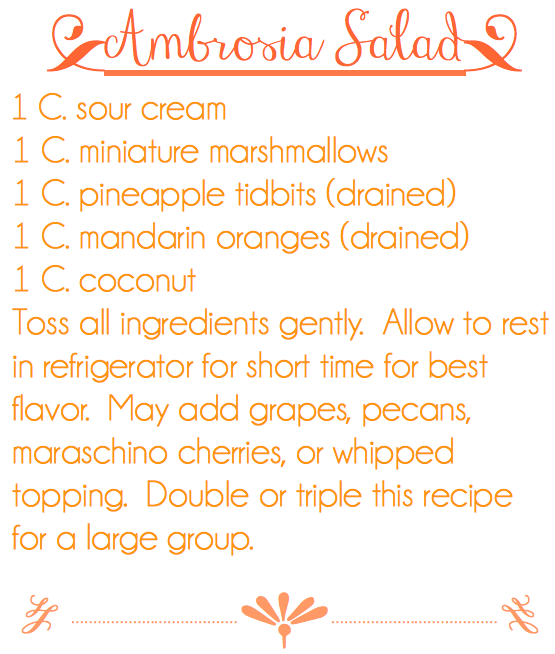 My mom used to make this when I was young, and it's the recipe I contributed to the little cookbook we made. The thing I love about this recipe is that it has 5 ingredients, and 1 cup of everything. Easy ingredients, and you practically have the recipe memorized after making it just once. You can't beat that! 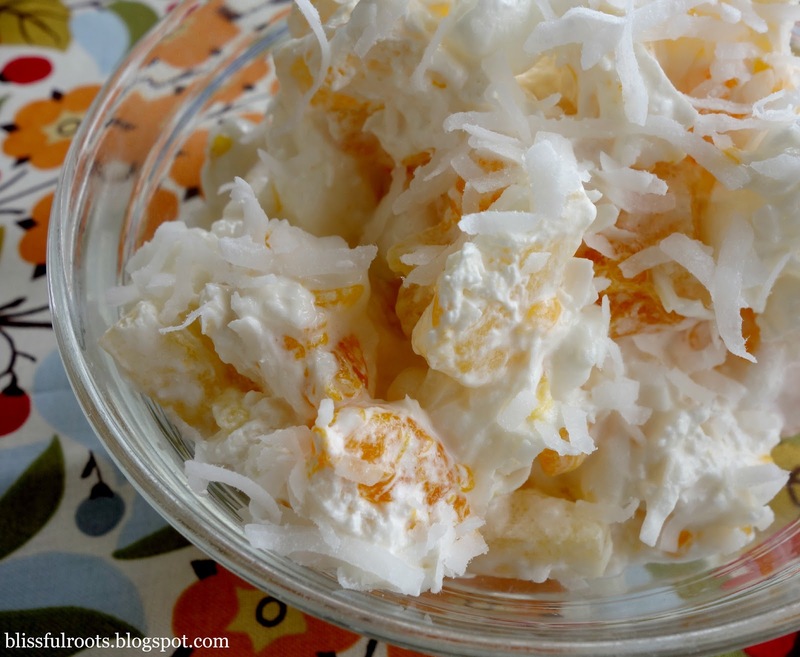 There are lots of versions of ambrosia salad out there, this one is very simple and easy. Like the recipe states, you can always experiment and add whatever else you'd like (nuts, maraschino cherries, bananas, apples,grapes, the sky's the limit). The recipe doesn't make a ton, so unless I'm just feeding my own family (husband and three boys) I usually double it. 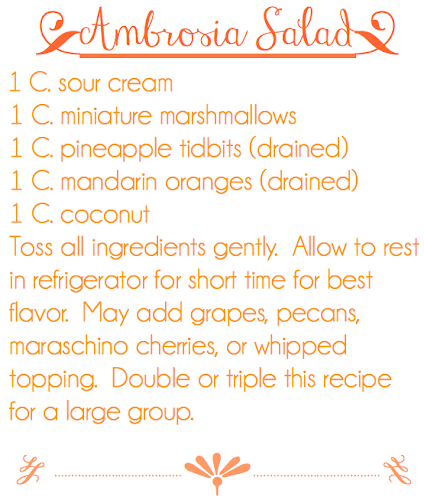 I've also tried substituting the sour cream for Cool Whip, and it's yummy. I actually like the sour cream better, but in a pinch Cool Whip works great. The salad just turns out a bit sweeter than the original version. Amazing! Stunning photography and I want to eat my screen! You have a fabulous blog and I have nominated you for a Liebster Award. Check out my blog A Handful of Everything for details! You're too kind, Krista! Thanks so much for visiting and for the nomination! I'm on my way over to visit you know. This salad looks really delicious!!! Now I want some salad:) By the way, I'm hosting a Link-Up party and would be thrilled if you decided to participate!!! It really is delicious! Thanks so much for your kind words. I'll be over to visit you. Looks so easy and delicious. Thank you for sharing. Looking forward to making it. I hope you enjoy it as much as we do. Thanks so much for taking the time to comment. Come back any time! Looks easy and like a great idea for a potluck. Thanks so much for sharing at Real Family Fun. It doesn't get any easier than this, really. Thanks for stopping by, KC. I'll be there! Thanks so much, Ruthie! Enjoy your day.